This is an akaushi (aka means red, and ushi is cow, as opposed to the *shooting from the hip* holstein in Justin's picture) that I stumbled upon while driving the 40 into Ichinomiya. It's interesting to see how people take care of their crops and livestock. It seems to me that the richer the rancher, the less attention each animal gets. The real small scale farmers treat each plant and animal with great importance, I suppose, because losing one cow could mean the only cow that they own. 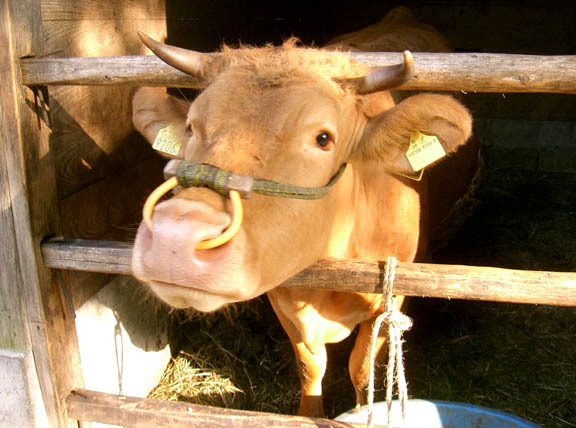 Ubuyama is now famous for their beef and, to a lesser degree, dairy products. The akaushi is truly a delicious variety, and fat is evenly distributed through out the meat. My village serves a really expensive cut of this beef in an interesting way. They take a huge, prime slab and cut off slices as it grills, reminiscent of kabob but much thicker. One thing that I don't understand is why no one around here can appreciate a good thick steak, pot roast, or juicy cut of prime rib. They prefer to eat it cut up into small cuts known simply as yakiniku. Since these slices of meat are so thin (usually about 4mm thick), you can't really eat them rare. They cook too fast for that, but yakiniku is certainly delicious. You can treat yourself to a steak in Ubuyama up around Hokubu, however a steak dinner will set you back no less than 3,000 yen. I have only gone once and it was worth it, but I that was a one time deal. The proprietor sent me home with a block of tofu, some tomatoes, and let me take home some tsukemono- they have 27 different types that are available to try! So what happens when I look upon the face of my dinner as it is still a living, breathing creature of God? My stomach rumbles, and I think "damn, that akaushi looks really delicious". It is interesting to note that I had the opposite reaction looking at, and more importantly smelling, the cattle of Harris ranch in Central California. Yep, that's a Holstein dairy calf at my manager's house (out in the sticks on the island). It stuck its tongue out at me! for the type of sustainable "honored life" livestock program I've been trying to find out on the West Coast with no avail. Great livestock, humane approach and tasty, natural, organic meats. Mom I already found the livestock program you should be investing in. Organic as all hell, cause it's in the middle of nowhere. It's about twenty minutes from Nam's house in Mahasarakham, and all the butchery is done by hand. I mean, they scraped every last bit of meat off the skeletons with a paring knife. They raise giant Brasilian frogs for meat in a nearby pond, as well. This page contains a single entry from the blog posted on May 20, 2004 6:36 PM. The previous post in this blog was The Hunger. The next post in this blog is Moderation is Masturbation?.